For the airport near Jacksonville, North Carolina, see Albert J. Ellis Airport. Construction started in 1965 on a new airport to handle travel to nearby naval bases. The new airport was dedicated on September 1, 1968, replacing Imeson Field;. Terrain precluded lengthening the runways at Imeson, a necessity with the inception of commercial jet airliners. A new idea at JIA was separating departing and arriving passengers on different sides of the terminal (as can be seen in the photo on this page). This is no longer the case, and the airport (which has greatly expanded since the picture was taken) now uses the more typical layout with departing passengers on an upper level with an elevated roadway, and arriving passengers on the lower level. The second phase of the expansion program is being carried out over three years, commencing in mid-2006 and is projected to cost about $170 million. The new Concourses A and C are now open; the former concourses have been demolished. Work on Concourse B was given a low priority because the capacities of Concourses A and C were more than adequate for existing demand. The expansion was designed by Reynolds, Smith & Hills. The economic downturn of 2009 caused a decrease in passengers and flights. This prompted the JAA to commence the demolition of Concourse B in June 2009 because it was safer and easier for the contractor. The remains will eventually become part of an airline club lounge. After the debris was removed, asphalt was laid for ground equipment parking. The concourse will be rebuilt when passenger traffic increases, which the JAA projected in 2013. In 2018, the airport handled 6,460,253 passengers, breaking the previous record set in 2007. The airport covers 7,911 acres (3,201 ha) and has two concrete runways: 8/26, 10,000 x 150 ft (3,048 x 46 m) and 14/32, 7,701 x 150 ft (2,347 x 46 m). The terminal at JIA is composed of a baggage claim area, on the first floor and a ticketing area on the second floor, at the front of the structure. Past baggage claim and ticketing is the mezzanine, where shops, restaurants and the security checkpoint are located. Beyond the mezzanine are the airport's Concourses A and C, which include 10 gates each (for a total of 20), along with other shops and restaurants. The airport also has a Delta Sky Club on Concourse A. The airport's two runways form a "V" (with the tip of the "V" pointing west). A plan exists to build two more runways, each paralleling one existing runway. The one alongside the existing southern runway will be built first. No date has been set. In the fiscal year ending September 2016 the airport had 101,575 aircraft operations, an average of 278 per day: 58% scheduled commercial, 19% air taxi, 15% general aviation and 8% military. In August 2017, there were 54 aircraft based at this airport: 3 single-engine, 8 multi-engine, 25 jet and 18 military. Concurrent with the closure of Imeson Airport, the 125th Fighter-Interceptor Group (125 FIG) of the Florida Air National Guard (FANG) relocated to Jacksonville International Airport. Military Construction (MILCON) funds provided for the establishment of Jacksonville Air National Guard Base in the southwest quadrant of the airport and placement of USAF-style emergency arresting gear on the JAX runways. Upgraded from group to wing status and redesignated as the 125th Fighter Wing (125 FW) in the early 1990s, the wing is the host unit for Jacksonville ANGB and operates F-15C and F-15D Eagle aircraft. The 125 FW is operationally-gained by the Air Combat Command (ACC). 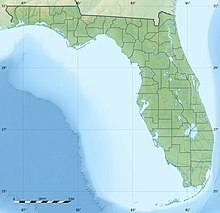 Jacksonville ANGB is basically a small air force base, albeit without the military housing, military hospital or other infrastructure of major U.S. Air Force installations. The Air National Guard provides a fully equipped USAF Crash Fire Rescue station to augment the airport's own fire department for both on-airport structural fires and aircraft rescue and firefighting (ARFF) purposes. The base employs approximately 300 full-time military personnel (ART and AGR) and 1,000 part-time military personnel who are traditional air national guardsmen. Jacksonville International Airport has direct public transit service to Jacksonville Transportation Authority's bus network. The CT3 "AirJTA" bus connects the airport to downtown Jacksonville, with connections to Greyhound Bus Lines and to the Jacksonville Skyway monorail system. On December 6, 1984, PBA Flight 1039 crashed on takeoff, killing all 11 passengers and 2 crew on board. On June 7, 1988, an Air National Guard F-16 fighter jet hit 2 wild pigs on the airport's runway while attempting to land. The jet veered off the runway, and pilot Lt. Col. Sam Carter was forced to eject. Carter suffered minor injuries and commented: "It's a very inglorious way for a $16 million aircraft to come to an end". Both pigs died. On October 1, 2013, at around 6:30 p.m. EDT, the airport was evacuated due to a suspicious package. At around 11 p.m. EDT, after the bomb squad was called and removed the 'destructive' device, the airport was given the all clear and reopened. ^ a b c FAA Airport Master Record for JAX (Form 5010 PDF), effective August 17, 2017. ^ "Jacksonville International Airport". www.jaa.aero. ^ Gibbons, Timothy J. (June 22, 2009). "Demolition of JIA's Concourse B brings end of an era". Florida Times-Union. ^ "Terminal Maps". Jacksonville International Airport. Retrieved June 13, 2014. ^ Pike, John. "125th Fighter Wing [125th FW]". www.globalsecurity.org. ^ "Frontier". Retrieved March 17, 2018. ^ "Transtats". Bureau of Transportation Statistics. Retrieved November 19, 2018. ^ "Jet Totaled After Hitting 2 Wild Pigs". Bangor Daily News. June 10, 1988. ^ "JIA Evacuated". WJXT. October 1, 2013. ^ "Jacksonville International Airport remains closed as police investigate bomb scare". Florida Times Union. October 1, 2013. ^ "JIA reopens; device 'rendered safe'". WJXT TV. Retrieved October 2, 2013.